We typically think of hope as a feeling that something desirable is likely to happen. Unlike a wish or longing, hope implies expectation of obtaining what is desired. In Hebrew, hope is the word tikvah (teek-VAH). Strong’s defines it as a cord, expectation, and hope. It comes from the Hebrew root kavah meaning to bind together, collect; to expect: – tarry, wait (for, on, upon). Did you notice the concrete idea of a woven cord? While hope in English is abstract, hope in Hebrew provides us with a strong visual. A bound cord, rope, or thread cannot only be seen with our eyes, but it is something we can grasp hold of with our hands. In other words, hope is something real enough that we can cling to it. Hope is not something out of our reach. The first occurrence of the word tikvah in the Bible is in the book of Joshua in the account of the two Israelite spies and the woman Rahab of Jericho. While the Hebrew tikvah is used here in its literal sense as a “cord or thread”, it still gives us a picture of its figurative picture of hope. The scarlet thread was Rahab’s hope. It was her only guarantee that her household would be spared by the Israelites. 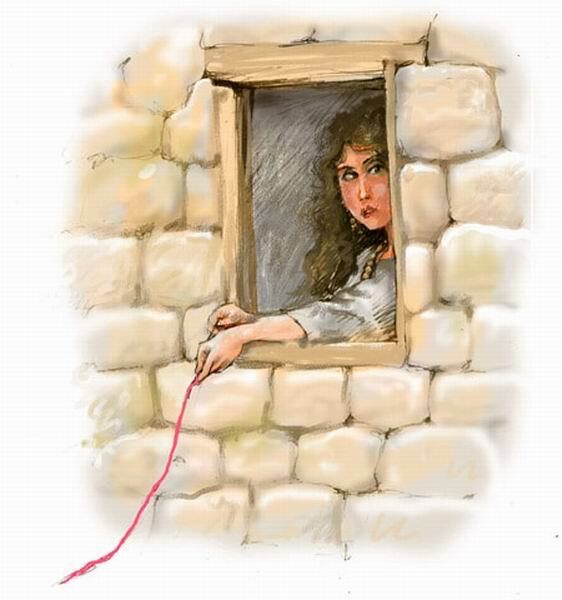 Though the physical cord had been tied to ensure their safety, Rahab still had to WAIT for the realization of the spies’ promise. This is where the root of tikvah, kavah, becomes relevant to our understanding. We can typically relate to hope. But we too often forget that hope is rooted in waiting. Being patient and waiting for an expected thing or outcome is very difficult for the majority of us. We see numerous examples of Biblical heroes that struggled with “waiting”, sometimes with devastating consequences. Think about Abraham and Sarah’s impatience with producing an heir. They eventually agreed to use the surrogate Hagar that produced Ishmael. We still see the effects of their impatience today through Ishmael’s offspring, a persistent enemy of Israel. So, the real question is how do we cling to hope? How do we keep from growing restless? How do we keep doubt from over taking us? The truth is that we can cling to the hope we have in the promises of Elohim (God). Like grasping onto a strong rope, our hope is tangible and secure. Nevertheless, we must wait for their fulfillment and not grow weary. But what about the myriads of issues in our daily lives that do not have a direct reference of promise in Scripture; is our hope real when we are trusting that YHWH will intervene in these affairs? Life isn’t black and white. There are many “grey” areas as we only see “dimly” most of the time. Our nature seeks certainty and absolutes no matter the issue or subject. Hope lives in the greyness and uncertainty of life; it can seem fuzzy. But, if we continue to cling to it, the sharp clarity of black and white will emerge into focus and with it the full technicolor of life. Yet, this realization isn’t why I’m writing. I want to be able walk steadily in the fuzzy grey path I currently find myself meandering. Some of our travels and seasons on this journey of life with YHWH don’t make sense to our natural minds. What appears in the natural to be unfair, trying, or even wrong are in fact the very place He desires us to be. How else would learn to lean on our faith, trust, and hope in His promise to never leave us or forsake us? Nevertheless, that doesn’t mean that we won’t feel that He has. But feelings aren’t a reliable gauge of truth. Feeling empty, dry, or deserted only causes us to cry out to the Almighty. When everything is hunky-dory we typically don’t cry out. My family is in a place in the wilderness where we are continually crying out. It seems as if the desert is going to consume us… but this is where I must CHOOSE to see with spiritual eyes and stand on the promises of my MASTER. He really is in control. And if I can only relinquish my every anxiety over to Him, I will find that shalom I so desperately am seeking. If you are in a similar place of desperation, join me in taking courage although it seems the sky is falling all around you. Even when the Word doesn’t speak directly to your situation or perhaps even appears contrary to a promise you’ve been standing on, know that YHWH is love. No matter the problem, issue, or situation, in the end His will and purposes ARE without a doubt being met. We must simply release our façade of control and be willing vessels no matter the cost. Can I let go of what I think is supporting me when I can’t see where I will land? Do I trust Him to catch me or throw me a rope? There is a precious scarlet cord that runs not only throughout the Bible, but through each of our lives. But in order to see it, we must do just what I’ve been writing about. We must let it go of ourselves and tenaciously take hold of His rope. That is our only real HOPE. I suppose my (and many other people’s) problem is the feeling (there’s that word again) that we aren’t worthy of being caught. We all know that we deserve nothing. Perhaps this limbo like desert is really a place of remembrance. We must remember what YHWH has already done in our lives. He is not a fickle Greek god. He is trustworthy and He changes not. This is what we must do when fear, doubt, and even restlessness tries to overtake our hope. We must think about that tangible woven cord that was plaited just for us. Perhaps this is the very reason Rahab’s cord was the color red or scarlet. It is to remind us of our scarlet sins and the scarlet blood that washes them away white as snow. Like Rahab, we don’t deserve to be spared. We aren’t worthy, yet He still loves us. He still forgives us. We mustn’t try to force or work our way around our situation. Real hope waits on the Master to provide the way, all we have to do is walk as He leads. Can we hold onto this hope in the midst of swirling chaos? Waiting and walking at the same time is the challenge! So true that we must not get in HIS way of HIS plan for us! This was such a blessing to me this morning! I was looking for what the word HOPE means and came across your blog. Really touched my heart thank you! Thank you for your kind words, I’m humbled that it blessed you! Enjoyed your commentary on the word tikvah. Enlightening and thoughtful. Thank you for sharing. This is so beautiful. Thank you for sharing! Yet, even when we must wait, He gives us the ways and the words to stay encouraged. How Great is Our God!! At the end of the day, it is a fight of faith, it’s what the enemy is ultimately after. Our confidence in Christ! Thank you for this beautiful and encouraging writing which blessed my soul! Praying that you and your family are now safely on the other side. Reblogged this on The Bee Hive. The Holy Spirit led me to do a word study on hope–something I really need. I love digging into Hebrew and so did a google search for “the hebrew word for hope”. One thing led to another and when I came upon this study I knew I’d found what I needed! I love the way God works! This was just what I needed, just when I needed it ! Thank you so much for this site. Thank you for your encouraging words, Sue! Messiah, i receive Your RESURRECTION POWER and declare that there is NO dead thing in my life. I speak life in ALL things pertaining to me. You have been PRUNING dead branches from me … LET my harvest BEAR much FRUIT. -that we can PRAISE YOU together, although we don’t even know each other.